If you are ever in Viet Nam, you need to visit the Caodaist temple in Tay Ninh. It is like no other. Its architectural set-up is truly a work of art. The outside walls are painted with dazzling colors and embellished with symbolic designs and sculptures. The top of the front entrance is adorned with an eye and rays, which represent wisdom, awareness and spiritual light pouring out onto the world. 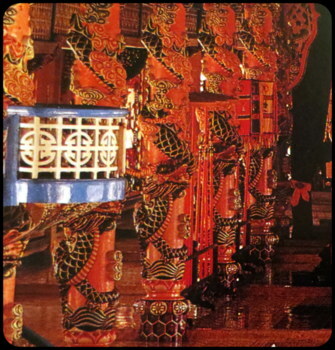 Huge columns, decorated with figures of colorful dragons, surround the inside of the temple. The richness of the artwork is beyond words. Undoubtedly, the hand of God guided the master builder in creating such a glorious spiritual temple. The religion practiced in this temple is a bit strange or one of a kind. It combines all the good elements of each religion into one in which God is the central focal point and creator of all. Ngo Minh Chien, also known as Ngo Van Chien, was the founder of this religion. He was a spiritualist with a passion for western and eastern theologies who was born in 1878. When he was approximately 41 years old, he began receiving divine revelations from God. It was during these manifestations, that the true meaning of religion was disclosed. According to him, God gave him explicit instructions for the creation of a new religion. The new religion was called Cao Dai, which means God. He was told that in order to spread world peace and harmony, he needed to integrate the good elements of all religions into one. In addition to spreading world peace and harmony, the basic principles are for humanity to attain spiritual growth and end the continuous cycle of reincarnation. This religion consists of one God, an earth goddess and an array of saints who are the assistants of God. It preaches love and compassion for all. Furthermore, it teaches that man is inherently good and killing is wrong. Due to the latter belief, many Caodaists were persecuted during the Viet Nam conflict. Caodaism was officially recognized in 1925, and continues to grow strong with 400 hundred temples and approximately 2 million followers. 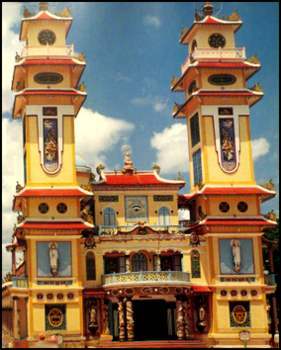 It is the third largest religion in Vietnam.